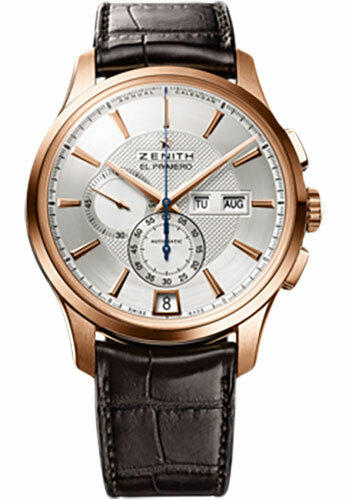 42mm 18K rose gold case, transparent sapphire glass back, silver guilloché dial, automatic El Primero 4054 movement with hours and minutes, small second, annual calendar, chronograph, approximately 50 hours of power reserve, brown alligator leather strap with gold pin buckle. Water resistant to 5 ATM. 42mm 18K rose gold case, transparent sapphire glass back,baguette diamond bezel , silver guilloché dial, automatic El Primero 4054 movement with hours and minutes, small second, annual calendar, chronograph, approximately 50 hours of power reserve, brown alligator leather strap with gold pin buckle. Water resistant to 5 ATM. 42mm 18K rose gold case, transparent sapphire glass back,baguette diamond bezel , horns baguette diamond, silver guilloché dial with baguette diamond hour markers, automatic El Primero 4054 movement with hours and minutes, small second, annual calendar, chronograph, approximately 50 hours of power reserve, brown alligator leather strap with gold pin buckle. Water resistant to 5 ATM.